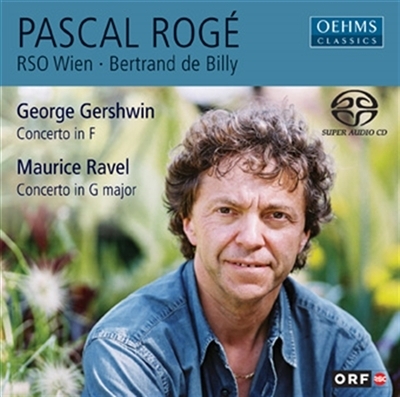 Pascal Rogé, French pianist and prize-winner (Grand Prix du Disque, Edison Award, Gramophone Award), on this SACD-recording with the RSO Vienna under Bertrand de Billy presents Piano Concertos by Gershwin and Ravel. “I had many apartments, but I was at home at the piano,” George Gershwin once revealed. The composer’s beginnings lay in the American hits and jazz tunes he heard in the streets of New York as a schoolboy, and that had fascinated him from the .rst moment on. He began learning the piano, adding lessons in harmony, counterpoint and instrumentation at age 14 as well. Working with his teacher Charles Hambitzer, who had immediately recognized his genius, Gershwin fell in love with the music of Debussy and Ravel, the new gods of impressionism. He began writing songs at a young age, some of which were even printed. He began working as a “plugger” for a publishing house at age 16, i.e. a pianist playing the newest hits all day, every day, in order to get word out about them to the man in the street. But Gershwin soon discovered that he could write much better songs himself. Initially, however, no one was interested. He switched jobs to work as a rehearsal pianist for the Jerome Kern/Victor Herbert show, slowly making himself indispensable with his musical tips and suggestions, and then won the revue’s diva for his own songs. Two of these were then incorporated into the show with great success. Gershwin became known on Broadway. He was hired by a publisher for $35 a week – this time as a composer. This was followed by successes, failures and successes – until he .nally landed a huge triumph in 1919 with his own self-composed revue La La Lucille, which boasted 100 performances and the world hits Nobody but you and Swanee. The latter of these was incorporated by beloved singer Al Jolson into his own revue. The song was dubbed the hit of the year and bestowed Gershwin with his .rst modest fortune and a comfortable degree of independence. His teacher Hambitzer had just died, not without first prudently acquainting Gershwin with Hungarian composer Edward Kilenyi, a student of Mascagni. Gershwin now began studying composition with Kilenyi, because he instinctively knew there was still much he needed to know to become a truly successful composer. At 26, Gershwin celebrated the next major triumph of his life as both pianist and composer of his own Rhapsody in Blue, written as a commission for King of Jazz Paul Whiteman and his orchestra. The audience at the February 12, 1924 premiere in New York’s Aeolian Hall included such luminaries as Heifetz, Kreisler, Godowski, Mengelberg, Rachmaninoff, Stokowsky, Stravinsky, Damrosch and Jerome Kern. Listeners were electri.ed. Gershwin’s success was indescribable – even with the press. Rhapsody in Blue was an immediate hit – not only in America, but in Europe as well. It made Gershwin, son of Russian immigrants, a wealthy man. Records and music alone brought him a quarter of a million dollars worth of royalties in ten years – and when Paul Whiteman played the piece in his .lm “The King of Jazz”, he paid Gershwin the enormous sum of .fty thousand dollars. There was only one problem: the young Gershwin always wrote his compositions at the piano. Others – a practice still usual on Broadway – took care of the orchestration. Rhapsody in Blue, for example had been orchestrated by highly talented pianist and arranger Ferde Grofé, a member of Paul Whiteman’s jazz orchestra. When the respected conductor Walter Damrosch commissioned a piano concerto from Gershwin shortly thereafter, guaranteeing him seven performances, Gershwin retired to a hotel and immersed himself in the study of classical concertos. It was completely clear to him that he had to compose as well as orchestrate this concerto himself to be regarded as a serious composer. The instrumentation alone took him four weeks. He completed the piano concerto at the beginning of 1925, calling it Concerto in F. Full of jitters, Gershwin hired 60 musicians and a conductor, rented the Globe Theater for an afternoon and secretly tried out the piece. He requested some passages to be repeated several times, made corrections and improved various details. But by and large, he was satisfied. The work’s premiere took place December 2, 1925 in Carnegie Hall under Walter Damrosch, who had placed the piece at the end (!) of the concert – after Glazunov’s Fifth Symphony and Henry Rabaud’s Suite Anglaise. Gershwin, suffering as always from horri.c stage fright, played the solo part himself. His name had again drawn numerous well known musicians – both supporters and detractors – as well as the most important reviewers. At the end, the audience stomped and cheered – but critics were ambivalent. Some celebrated the new “standard work of the century”; others criticized its composition and form and censured the music’s entertainment character. “Gershwin invents the melodies of our time with all their insolent lack of restraint, their feverish rushing ahead, but also with the extremely deep melancholy we are so intimately acquainted with,” wrote critic Chozinoff. Walter Damrosch said, “The second movement alone, with its dreamy mood reminiscent of a summer night somewhere in the South, proves Gershwin’s formidable talent.” Renowned English conductor Albert Coates found the Concerto in F to be simply the most signi.cant musical work of America. The concerto is based on jazz rhythms, of course, primarily the blues. It also weaves in popular dances of the time, with the Charleston heading the list. But above all, it contains Gershwin’s own themes and melodies, which are fresh, natural and full of sensitivity. He plays around with his material as naively as sophisticatedly, his instrumentation is precise, exploiting shrill, extreme ranges at times (muted trumpets at the top of their ranges at the beginning of the second movement); the piano part is sometimes simpli.ed to the point of chunkiness, lending it more of a percussive function, but it always returns to the lyricism Gershwin was so capable of. The pell-mell character, the unresolved dissonances, crazy trombone glissandos, diminished ascending and augmented descending melodic intervals are characteristic of jazz. During this time, Maurice Ravel was completing his major tour of the US and Canada, which took him from New York to Chicago, San Francisco, Seattle, Vancouver, Minneapolis, Houston, Colorado, Buffalo and Montreal, and during which he also conducted some of his own works. Ravel’s songs, piano compositions, and orchestral works, including Sheherazade, Rhapsodie espagnole, the ballet suites from Daphnis und Chloe, his orchestration of Mussorgsky’s Pictures at an Exhibition, the Valses nobles et sentimentales, the suite Le tombeau de Couperin, but above all La Valse and Tzigane had made him world famous. Back in Paris, he would hear the premiere of his ballet Boléro in the Paris Opera on November 20, 1928. One year later, Ravel tried out a unique experiment: working on two piano concertos at once, using completely different styles for each. Stacks of music paper lay to each side of his piano. On one, he jotted his Concerto in G-Major, on the other, his Concerto for the Left Hand, which the one-armed Austrian pianist Paul Wittgenstein had commissioned. Of the former, Ravel said that it “resembled Mozart and Saint-Saëns;” the style of the other “was not so simple.” Ravel completed the Concerto for the Left Hand .rst. The work premiered in Vienna on November 27, 1931, played by Wittgenstein himself. The Concerto in G Major was .rst performed on January 14, 1932 with soloist Marguerite Long, to whom the work is dedicated. Ravel conducted the performance himself. Immediately thereafter, Ravel and Long began a successful tour through Central Europe with the work. In the Concerto in G Major, Ravel uses musical material from an earlier planned Basque Rhapsody. The .rst movement (Allegramente) begins with a happy theme played by the piccolo, which some music researchers say resembles a dance from the Navarre region. But the ebullient, bitonal begin is also highly reminiscent of Stravinsky’s Petrushka. Its jazzy references cannot be overheard. Ravel con.rmed this with the words, “This concerto is related to my violin sonata, in which I also used elements of jazz, though only moderately.” Are there also remembrances of Gershwin’s music, of Ravel’s impressions from his 1928 visit to America? Parallels to Gershwin are likewise not to overhear – for example in the second movement, one of Ravel’s most poetic compositions ever. Similar to Gershwin’s, this movement builds on a long piano monolog, which Ravel augments and re.nes through strange, rhythmic, accompaniment .gures in the left hand: neo-classicism in the spirit of Haydn and Mozart! The short Presto-Finale rondo takes us back to Scarlatti; the piano sweeps breathlessly across the landscape interrupted by impudent jazz riffs (trombone glissandos! ), the music is rhythmically electrifying, as though Ravel – nearing the end of his life – intended to take music halls by storm.